In 2006 the International Biometric Association conducted a regular Fingerprint Verification Competition (FVC-2006). At this time the purpose of the testing of fingerprint identification algorithms was to determine the best software developments in this field. It is to say that the International Biometric Association includes the world’s leading universities in the field of biometrics, such as the University of Bologna, the State University of San Jose, the State University of Michigan and the Independent University of Madrid. 53 software development companies and research institutes took part in this competition. In total the participants submitted more than 70 biometric algorithms. There were several databases of images of fingerprints from different sources available for testing. The competition had to evaluate such parameters as accuracy, identification speed and performance of the presented algorithms. 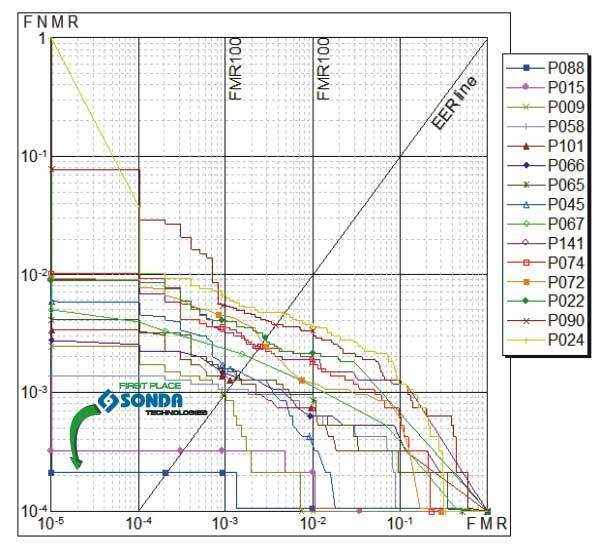 Consequently Sonda took the first place on the database of fingerprints obtained with optical fingerprint scanners. In total, Sonda took the 3-rd place.